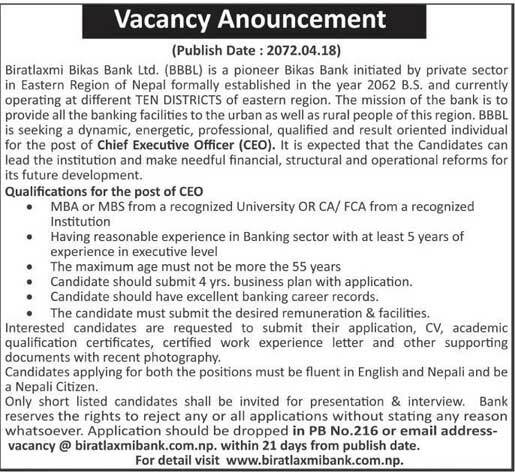 Vacancy from Biratlaxmi Bikas Bank Ltd.
Biratlaxmi Bikas Bank Ltd. (BBBL) is a pioneer Bikas Bank initiated by private sector in Eastern Region of Nepal formally established in the year 2062 B.S. and currently operating at different TEN DISTRICTS of eastern region. The mission of the bank is to provide all the banking facilities to the urban as well as rural people of this region. BBBL is seeking a dynamic, energetic, professional, qualified and result oriented individual for the post of Chief Executive Officer (CEO). It is expected that the Candidates can lead the institution and make needful financial, structural and operational reforms for its future development. • Candidate should submit 4 yrs. business plan with application. • Candidate should have excellent banking career records. • The candidate must submit the desired remuneration & facilities.